If you’re looking for a new delay on your board, this might be a great deal for you. This morning, I stumbled across a Way Huge Aqua Puss deal. The Way Huge Aqua Puss lists for $254.61 and is usually available for $150, but is currently on sale for a great price of $118.00 at Amazon.com. At the time of this posting there were 9 units in stock, but when numbers get lower, the price sometimes jumps up. So if you’re interested in picking up this delay at this price, you best jump on it. The Way Huge Electronics Aqua-Puss MkII Analog Delay pedal offers bold analog and tape delay echo. Over the years, the Way Huge Aqua-Puss received tremendous praise for its outstanding tone, but because of its scarcity, the cost of finding a used pedal went soaring. Once you hear this reissue, you will know exactly what all the fuss was about. One twist of the Aqua-Puss pedal’s Delay knob takes you from a tight 20ms delay to a cavernous 300ms. The Feedback control regulates delay duration and intensity. But watch out. Extreme settings can send the Aqua-Puss MkII into self-oscillating psycho-freak-out mode. Meanwhile the Blend knob lets you set a balance between dry and delayed signal—from mild to wild. The Aqua-Puss MkII delivers all the spooky mystery of vintage analog delay and tape-based echo, with none of the hassle of creaky, ancient gear. This reissued pedal features delay, feedback and blend knobs, just like the original. 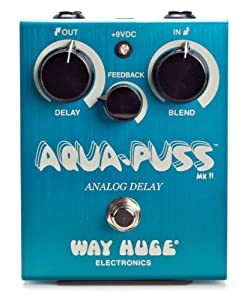 Again, the Way Huge Aqua Puss Delay is currently on sale for a great price of $118 at Amazon.com! Two day sale on the TC Electronic Polytuner at Fat Tone Guitars!